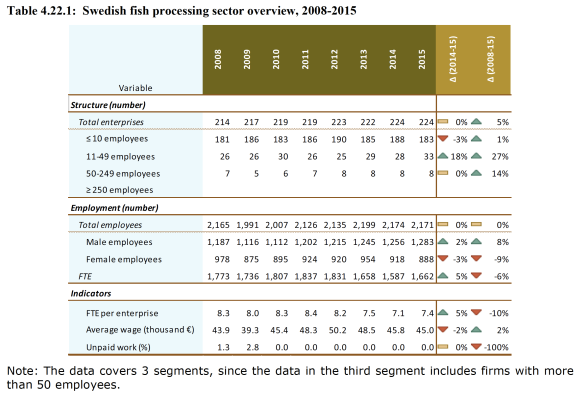 The fish-processing sector in the EU is in rather good shape, according to the latest Economic Report of the EU Fish Processing sector. The report compiles several sets of raw economic data to analyse the overall performance of the sector in 2015. The resulting figures speak for themselves. The sector’s turnover, which had been on the rise since 2008, came very close to the €30 billion mark. Its gross value added, i.e. its contribution to the economy through wages and gross profit, was nearly €6 billion. Total employment remained relatively stable over the 2008-2015 period, totalling 126,413 people in 2015 – 45% of which were women. Over the same period wages increased by 22% and the average annual salary was €30,133 per full time equivalent. Commenting on the report, Commissioner Vella said: “It’s great to see that our processing sector is doing well – in terms of product quality, staff remuneration and contribution to our economy. Further proof that with the good health of the living resources comes a dynamic maritime economy”. The Economic Report of the EU Fish Processing sector 2017 is obtained from economic data provided by Member States authorities. It is the result of a joint analysis work by economists of the Scientific, Technical and Economic Committee of Fisheries (STECF), the Commission’s Joint Research Centre (JRC) and the Directorate-General for Maritime Affairs and Fisheries (DG MARE).